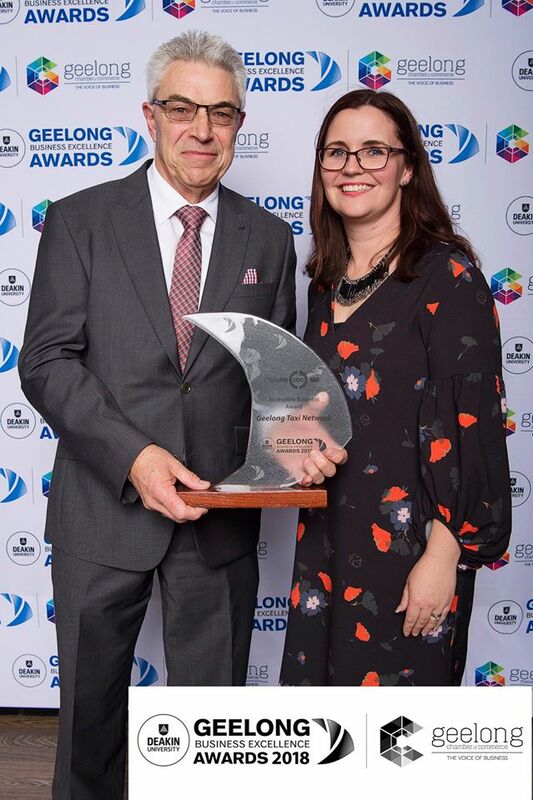 A great night at the 2018 Geelong Business Excellence Award was topped off by Geelong Taxi Network becoming a finalists in three categories and winning the ‘Accessible Business’ category award. Geelong Taxi Network provides a 24/7 service to over 200,000 customers a year and our wheelchair-accessible Maxi Taxis complete on average 3000 trips per week. As a registered NDIS provider Geelong Taxi Network has become Geelong’s premier transport provider for people with disabilities. A fleet of around 30 wheelchair-accessible Maxi Taxis (WATs) accommodates groups up to 10 passengers, or up to two people in wheelchairs. Our dedicated WAT drivers have undertaken special training dealing with securely transporting people in wheelchairs, as well as completed extra training in customer service for people with disabilities. The Geelong Taxi Network WAT fleet is in high demand and is usually booked out at peak times in the morning and afternoons on weekdays, taking people with disabilities to day programs, work places, schools and appointments. “It’s been a privilege for Geelong Taxi Network to contribute to the mobility of our disabled community in Geelong and district on a daily basis. “, says CEO Peter Valentine. Geelong Taxi Network currently operates Victoria’s largest urban taxi fleet and provides an income to 120 operators, 350 drivers and 20 administration staff. Due increased demand of group-travel we have recently launched MyBus Geelong a mini van charter service, offering corporate and private hire, tours and airport transfers.